The tank hunter concept has mostly been relegated to military history’s footnote section, just like the airborne tank, the heavy tank and other developments and improvisations of the Second World War. The first WW2 German tank hunters were born due to the urgent and stringent need to counter well-armored tanks on the Allied side, be it the Matilda II, Char B1 or KV-1. The engineers mated existing chassis with the largest antitank guns available in order to provide a quick counter for these heavily armored vehicles. There were several tank hunter prototypes being developed at the beginning of the Cold War, meant to counter the Soviet heavy tanks and the overwhelming number of Soviet tanks in general. However, due to the improvement of tank guns, the rise of AT missiles and the lack of large-scale conflicts, the gun-armed tank destroyer concept has disappeared almost entirely from today’s armies. Cold War China felt a stringent need for a vehicle capable of carrying the only gun they had which was capable of defeating the armor of the latest Soviet tanks like the T-72 and T-80. This led to the Type 89 program which started in the late 1970s, the new model entering service in 1989 only to be retired in 2015. 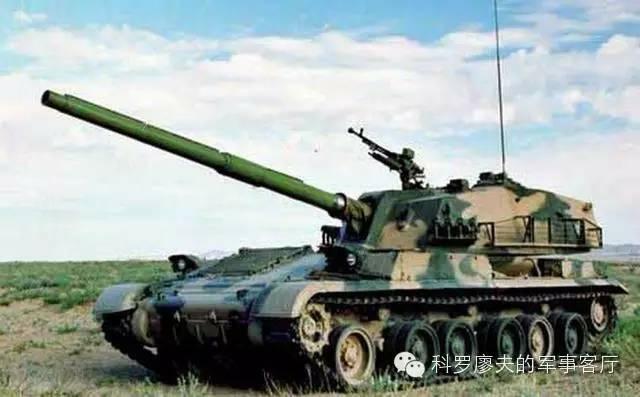 The Chinese had been developing their own second-generation MBT under the Feng Bao program which was meant to provide the PLA with a modern 120mm smoothbore gun capable of firing modern APFSDS ammunition. This project failed due to Rheinmetall’s refusal to license its L44 smoothbore gun technology back in 1978, when the Leopard 2 was introduced. 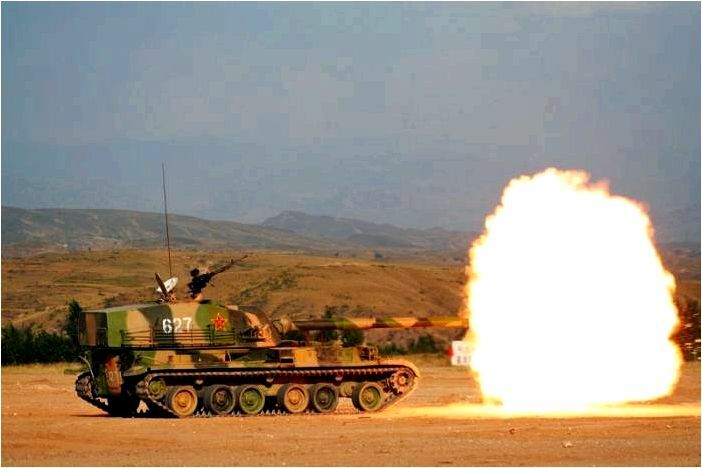 The PLA launched a program to design its own Western-style 120mm high-pressure smoothbore gun the same year. This gun was to be fitted on a new platform that was intended to be a dedicated tank hunter. The primary design goal was to provide an APFSDS-firing gun able to penetrate the frontal armour of all Soviet-built MBTs at a distance of up to 2,000m. The secondary long-term goal was to provide the same capability against Western MBTs of the 1980s generation. Apparently, in 1979, three prototypes of the gun were tested and fired about 1000 rounds. These trials continued until October 1980. 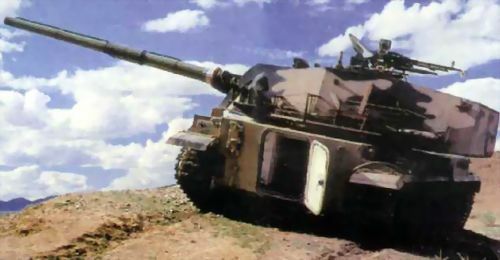 In early 1981 the design was completed and the gun was certified as being able to pierce a 200 mm armor plate at 68 degrees at a distance of 2 km firing armor piercing ammunition with a muzzle velocity of 1,646m/s. 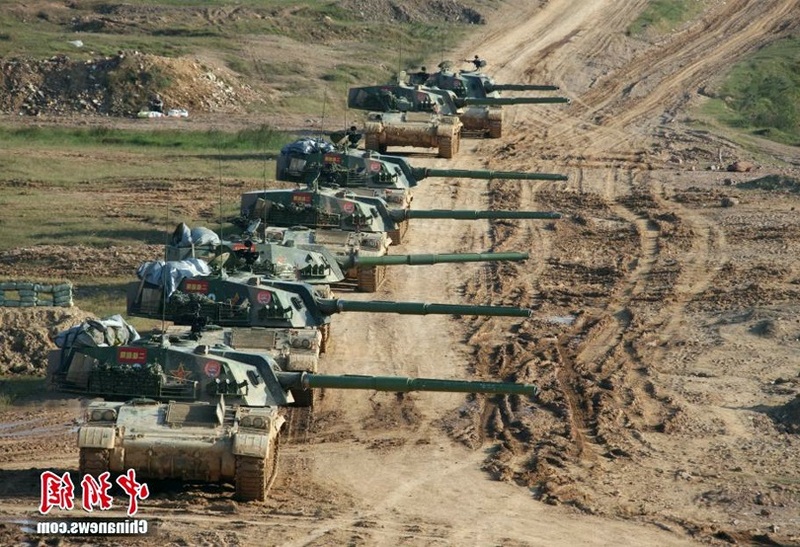 Further development of the Chinese 120mm was led from 1982 by the 774 Factory. The gun compared well to the Soviet 125 mm during trials held in 1984, and demonstrations at Nankou, Beijing in 1985. The range though was limited compared to the NATO equivalent of the time. However, a political decision led ultimately to the Soviet-type 125 mm being selected instead. This gun had a fully automatic gun-loader and ATGM capability. Therefore, the indigenously designed 120 mm was left to be used only on the Type 89 anti-tank platform. This stopgap vehicle (before the new 125 mm armed MBT was ready) was based on the existing chassis of the Type 321 tracked utility chassis. The heavy turret was placed at the rear, the engine at the front. The same chassis is also shared by a SPAAG and a self-propelled howitzer. The armor protection was severely hindered by the limited chassis load, and compromises had to be found because of the weight of the turret. Eventually, the Type 89 was considered as a long range sniper. As a result of the role and weight limitations the armor was limited to the bare minimum, with 50 mm being the estimated maximum for the front of the vehicle. No additional armor has been applied to the vehicle according to available photos. This lack of protection was the main criticism of this model and resulted in its relatively short service span. Crew protection included full NBC protection and automatic fire extinguishers in the engine and crew compartments. There was a large hatch for the crew to enter and exit the tank at the back of the hull. 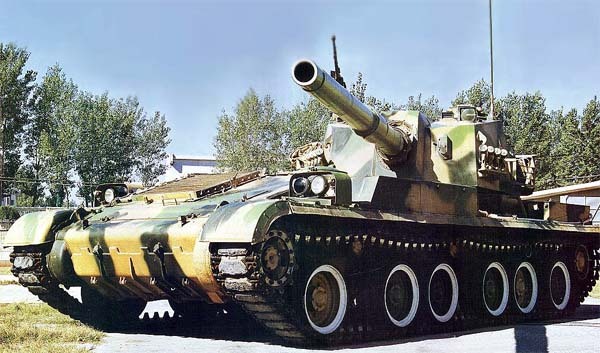 The Type 89 tank destroyer chassis is roughly the same as that of the Type 83 150 mm Self Propelled Howitzer, known as the Type 321 tracked utility chassis. Both have the same front-mounted engine and conveniently large turret ring at the rear. The power unit is a liquid cooled, 12-cylinder, 4-stroke WR4B-12V150LB/12150L turbocharged diesel coupled with a mechanical transmission. This engine developed 520 hp, providing a power to weight ratio of 16 hp/t. This gave a healthy, if not impressive 55 km/h top speed on flat terrain. The tank was also able to climb a 60% gradient, 40% side slope, 70 cm vertical step, 2.7 m trench, and ford 1.3 m of water. The 50 caliber long 120 mm smoothbore gun is covered by a thermal sleeve, and was the most important feature of the design, taking up most of the available space in the rear mounted turret. It was coupled with a coaxial turret 7.62 mm LMG (range 1,800m, 250 rpm) and an anti-aircraft 12.7mm heavy machine gun (range 2000m) located on the roof. The main gun’s maximum firing range was 9000 m (5.6 miles) in indirect fire with the 960 m/s HEAT round. In that case, ammunition could be loaded from the rear hatch for continuous fire, when the tanks are acting like a self-propelled unit. There is also a small reloading hatch in the rear of the turret. In direct fire, the optimal range was about 2000 m, up to 2500 m max. Its maximum rate of fire was 10 rpm with a semi-automatic gun loader, and the gun could depress to -8° degrees and elevate to + 18 degrees. A fume extractor was located in the middle section of the gun barrel. 30 rounds were carried, including APFSDS (Armor-Piercing Fin-Stabilised Discarding-Sabot), HE (High-Explosive), HE-FRAG (High-Explosive, Fragmentation), and HEAT (High-Explosive Anti-Tank) rounds. The APFSDS round (muzzle velocity 1,660 m/s) could penetrate 450 mm of armor at a distance of 2 km. The gun is not stabilized, but fire direction comprises a Tank Simplified Fire Control System coupled with a laser rangefinder and night vision sights. 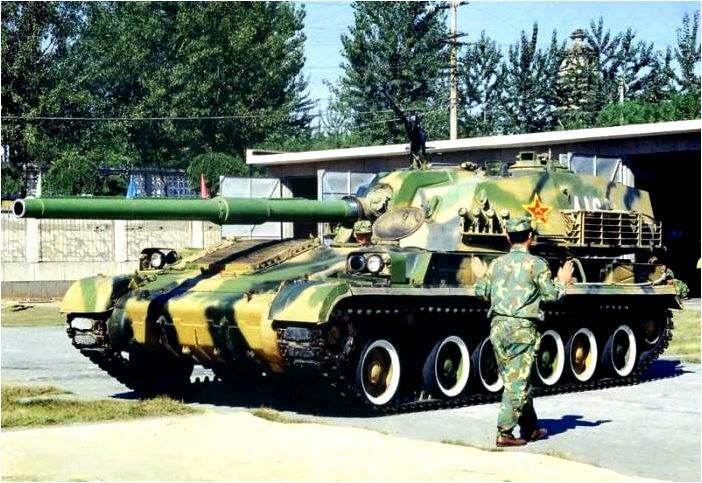 The Chinese PTZ89, aka Type 89, was designated as a Tracked Tank Destroyer. In 1985, the Type 89 was demonstrated to officials in Nankou, Beijing. Other tests took place between 1987 and 1988. The production was approved and started in late 1988. In 1989, according to most sources, twenty vehicles were delivered to the PLA (as shown in the annual Beijing parade) and the design certificate was granted in 1990. However, the end of the Cold War stopped all production and it is generally considered that between 40 and 100 vehicles were made before production stopped. The Type 89 had a quarter of century service span, which was far less than the average Chinese tank. 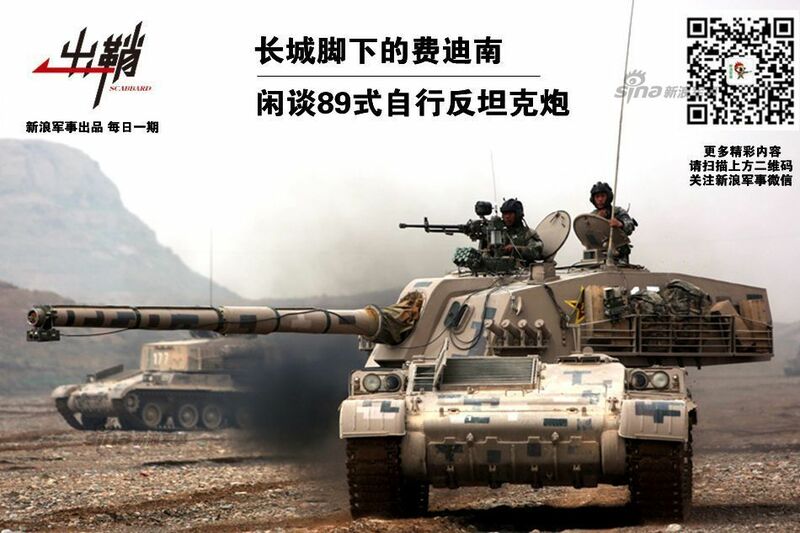 They had been in service with the 39th Army Group, in the Beijing Military Region, Jinan Military Region as well as divisional anti-tank reserves. Its official retirement ceremony took place on the 3rd of November 2015. Reasons for this were multiple, according to experts, including, crucially, a non-stabilized, relatively short-range gun, high maintenance costs, and weak armor. It was deemed to be much more efficient to use ATGMs instead of a dedicated anti-tank gun platform. Such ATGM systems are carried on a variety of specialized vehicles, like the 4×4 WZ550 HJ9. PGZ 07 which uses the same chassis. It’s strange, the country that always use Warsaw Pact-type ammunition suddenly designed a western style 120mm gun. Is the gun compatible with NATO 120mm ammunition? If yes, they must be reverse engineered or license-produced the ammunitions and I wonder where they got a source for it. If no, are they use proprietary / specifically designed ammunitions for the gun? Maybe they stole the design? It wouldn’t be the first time the Chinese stole military stuff.